It is the time of year for applying for academic jobs and so I have been polishing up my CV. 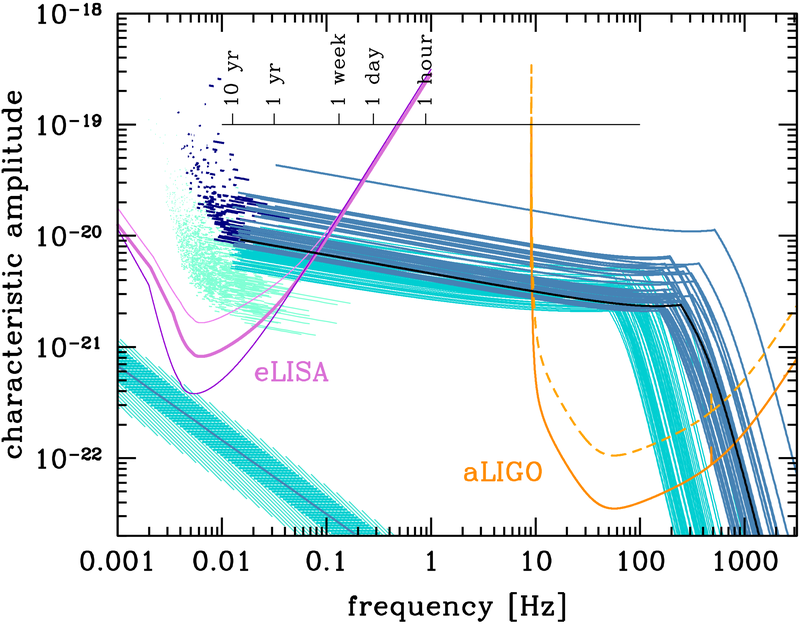 In doing so I spotted that I had missed the publication of one of the LIGO Scientific–Virgo Collaboration papers. In my defence, it was published the week of 8–14 February, which saw the publication of one or two other papers [bonus note]. The paper I was missing is on a search for continuous gravitational waves. 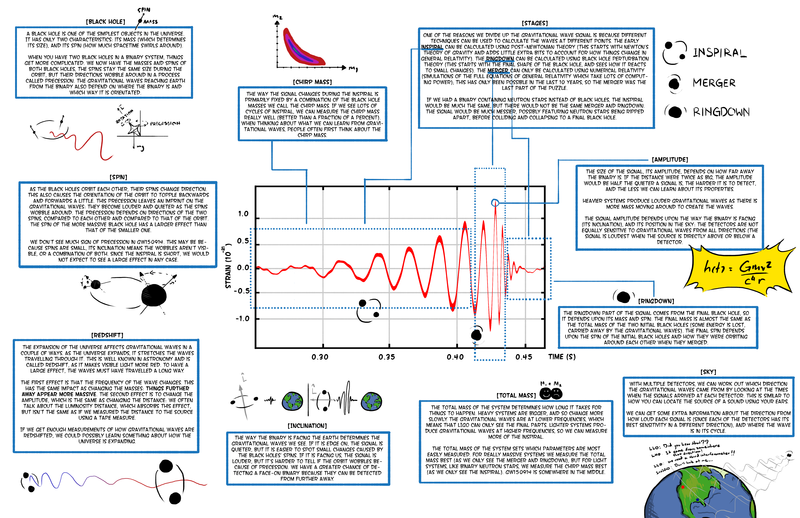 Continuous gravitational waves are near constant hums. Unlike the chirps of coalescing binaries, continuous signals are always on. 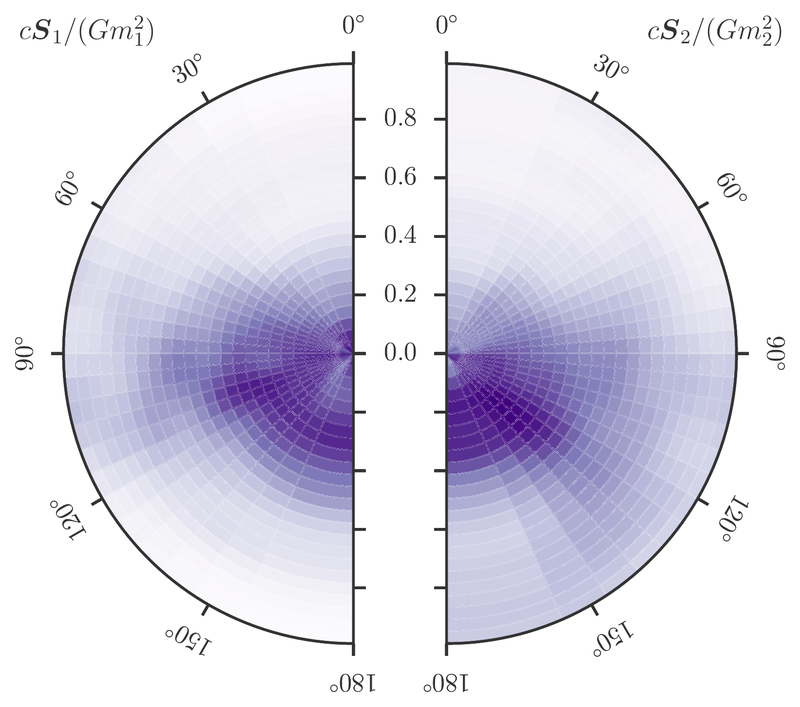 We think that they could be generated by rotating neutron stars, assuming that they are not perfectly smooth. 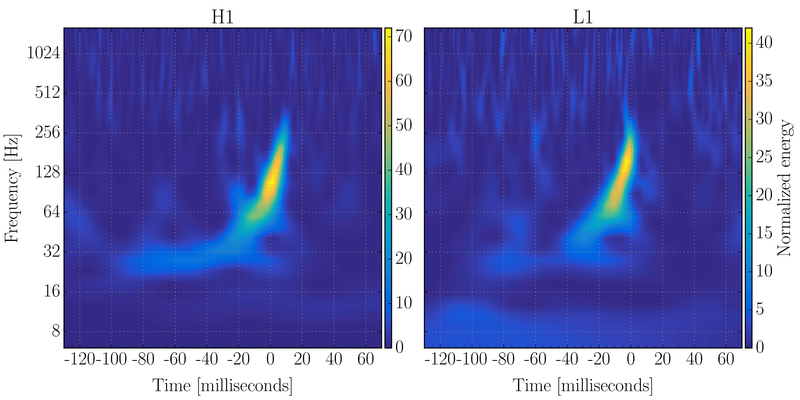 This is the first search to look for continuous waves from anywhere on the sky with frequencies below 50 Hz. 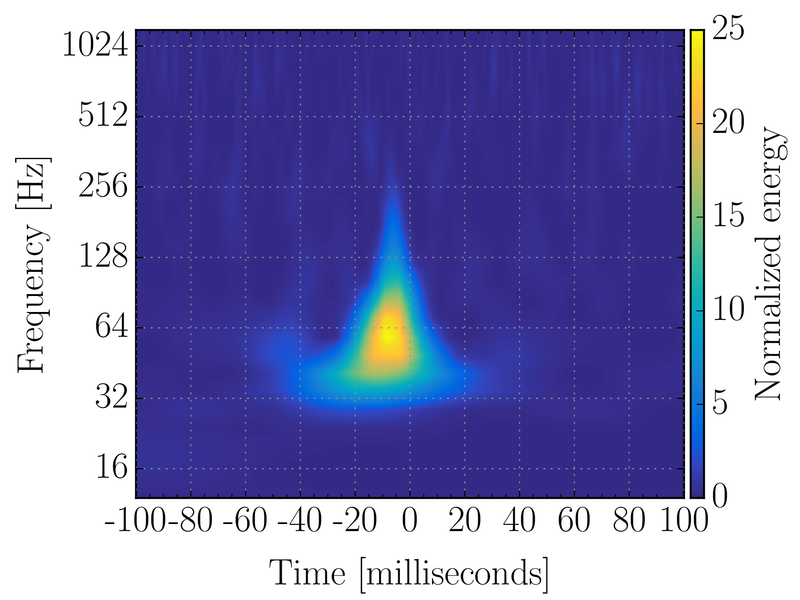 The gravitational-wave frequency is twice the rotational frequency of the neutron star, so this is the first time we’ve looked for neutron stars spinning slower than 25 times per second (which is still pretty fast, I’d certainly feel more than a little queasy). 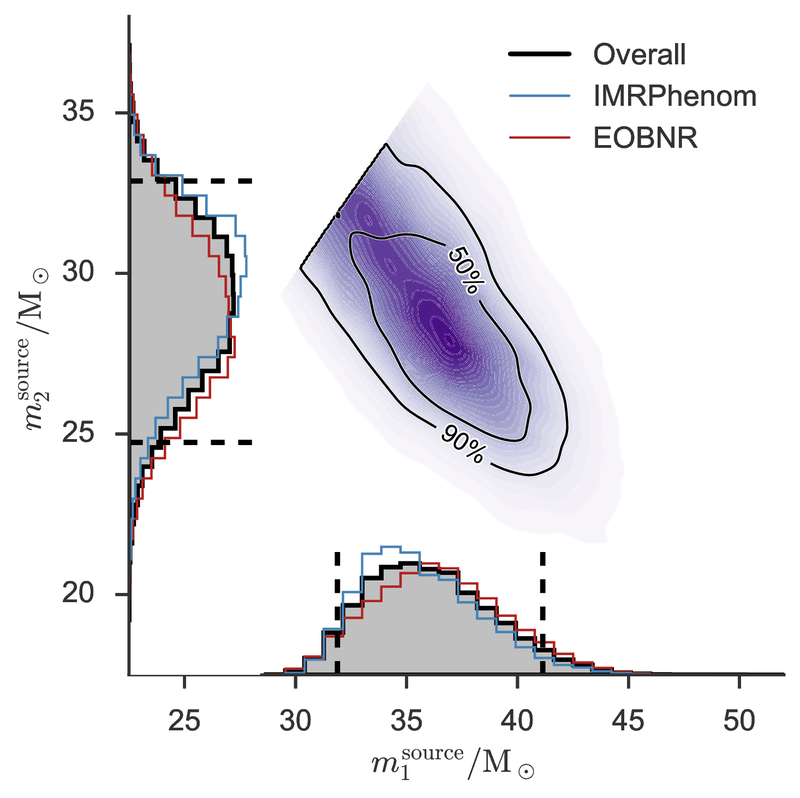 The search uses data from the second and fourth Virgo Science Runs (VSR2 and VSR4): the detector didn’t behave as well in VSR3, which is why that data isn’t used. 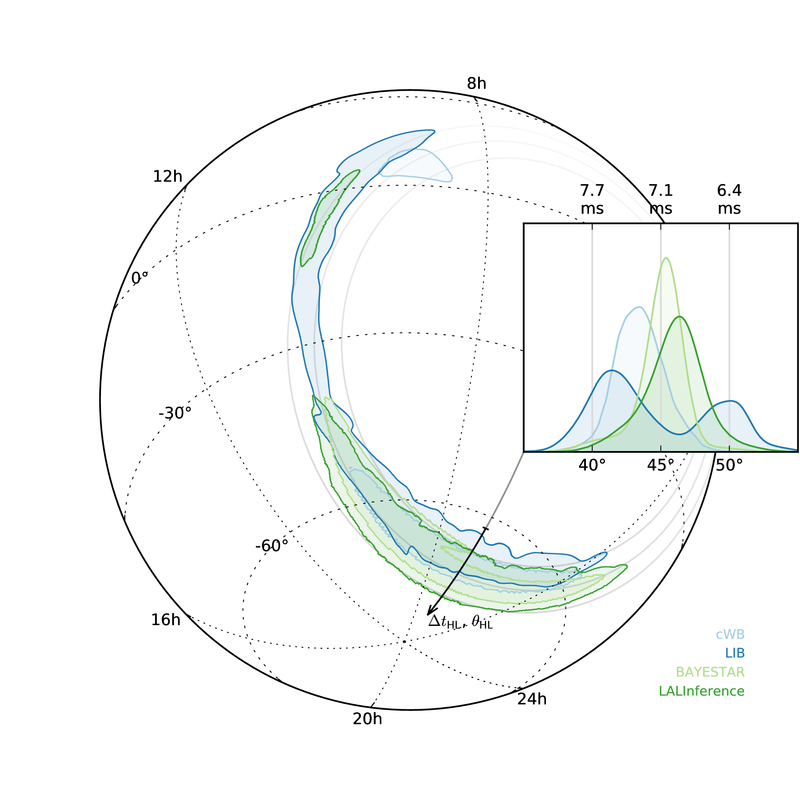 The frequency of a rotating neutron star isn’t quite constant for two reasons. First, as the Earth orbits around the Sun it’ll move towards and away from the source. This leads to the signal being Doppler shifted. For a given position on the sky, this can be corrected for, and this is done in the search. Second, the neutron star will slow down (a process known as spin-down) because it looses energy and angular momentum. There are various processes that could slow a neutron star, emitting gravitational waves is one, some form of internal sloshing around is another which could also cause things to speed up, or perhaps some braking from its magnetic field. We’re not too sure exactly how quickly spin down will happen, so we search over a range of possible values from to . 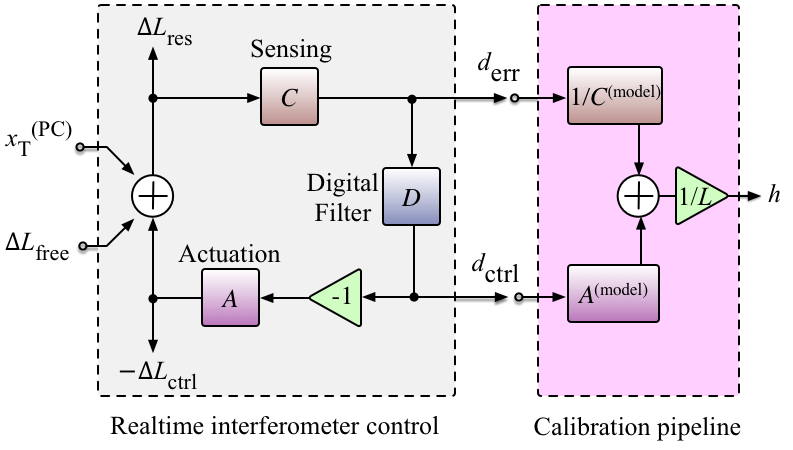 The particular search technique used is called FrequencyHough. This chops the detector output into different chunks of time. In each we calculate how much power is at each frequency. We then look for a pattern, where we can spot a signal across different times, allowing for some change from spin-down. 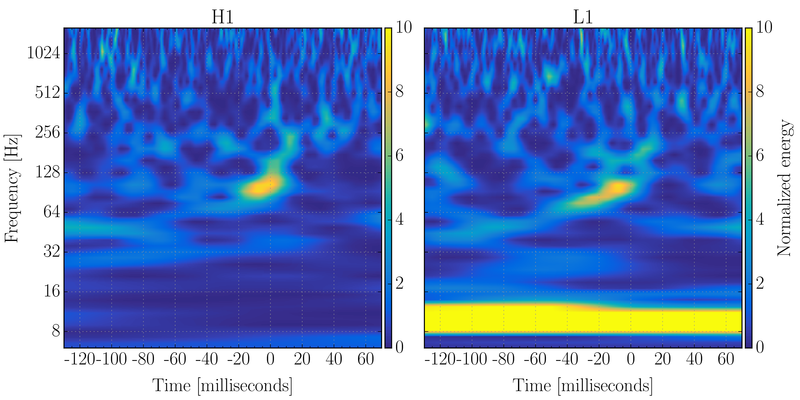 Recognising the track of a signal with a consistent frequency evolution is done using a Hough transform, a technique from image processing that is good at spotting lines. The search didn’t find any signals. This is not too surprising. Therefore, we did the usual thing of setting some upper limits. 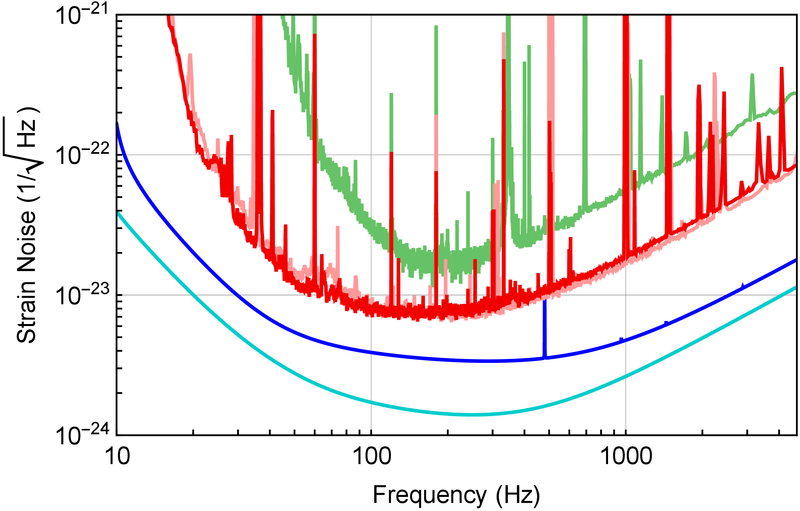 The plot below shows 90% confidence limits (that is where we’d expect to detect 9/10 signals) on the signal amplitude at different frequencies. 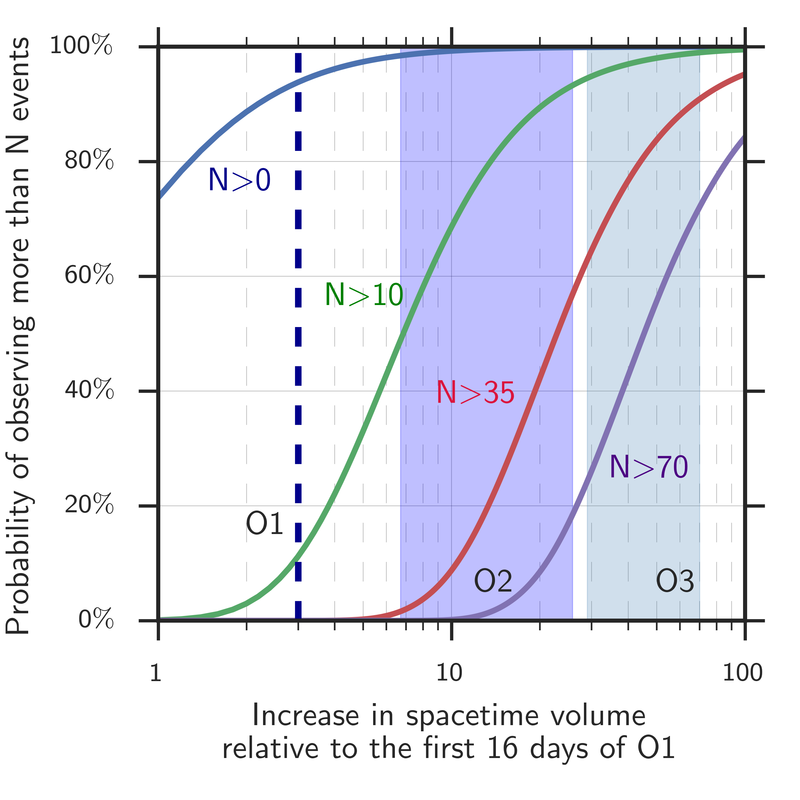 90% confidence upper limits on the gravitational-wave strain at different frequencies. 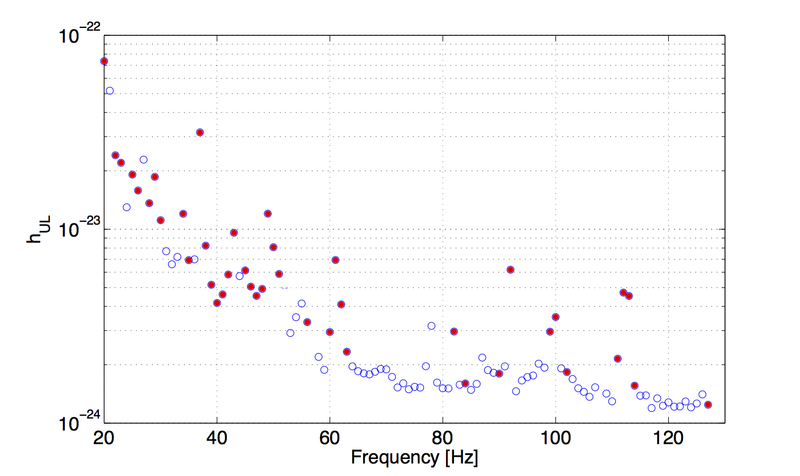 Each dot is for a different 1 Hz band. Some bands are noisy and feature instrumental artefacts which have to be excluded from the analysis, these are noted as the filled (magenta) circles. In this case, the upper limit only applies to the part of the band away from the disturbance. Figure 12 of Aasi et al. (2016). Given that the paper only reports a non-detection, it is rather lengthy. The opening sections do give a nice introduction to continuous waves and how we hunt for them, so this might be a good paper is you’re new to the area but want to learn some of the details. Be warned that it does use for some reason. After the introduction, it does get technical, so it’s probably only for insomniacs. However, if you like a good conspiracy and think we might be hiding something, the appendices go through all the details of removing instrumental noise and checking outliers found by the search. 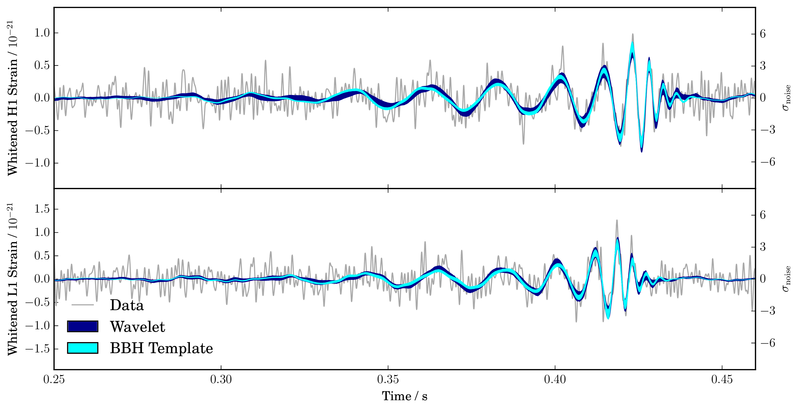 In summary, this was the first low-frequency search for continuous gravitational waves. 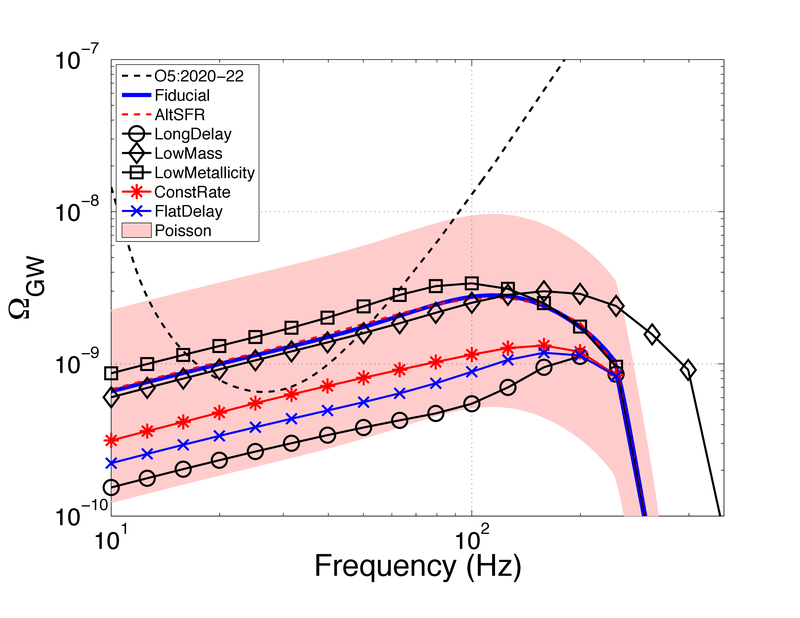 We didn’t find anything in the best data from the initial detector era, but the advanced detectors will be much more sensitive to this frequency range. 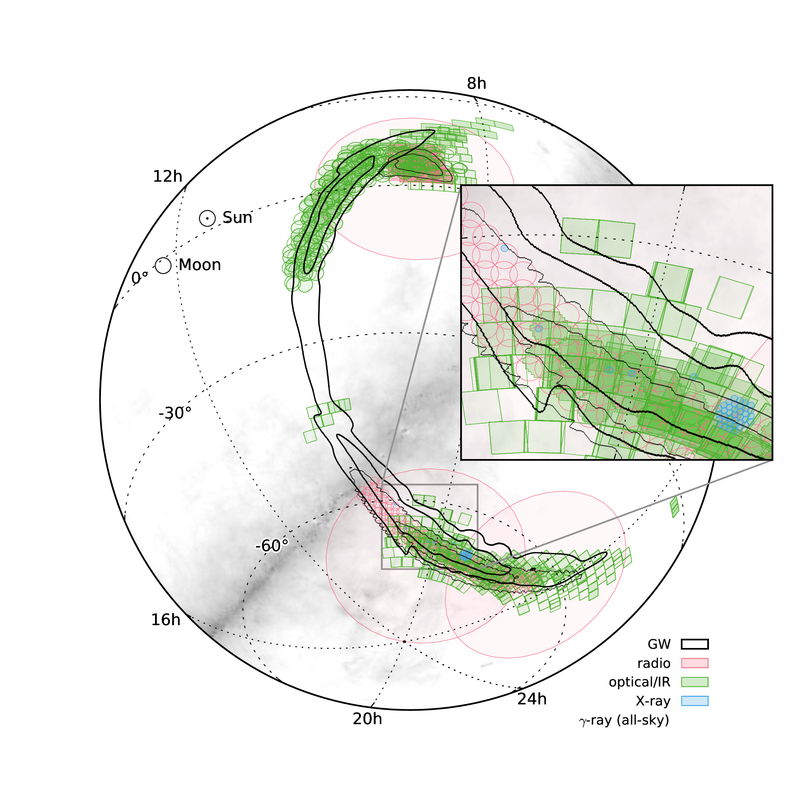 Slowly rotating neutron stars can’t hide forever. Greatest regret: I didn’t convince the authors to avoid using “air quotes” around jargon. 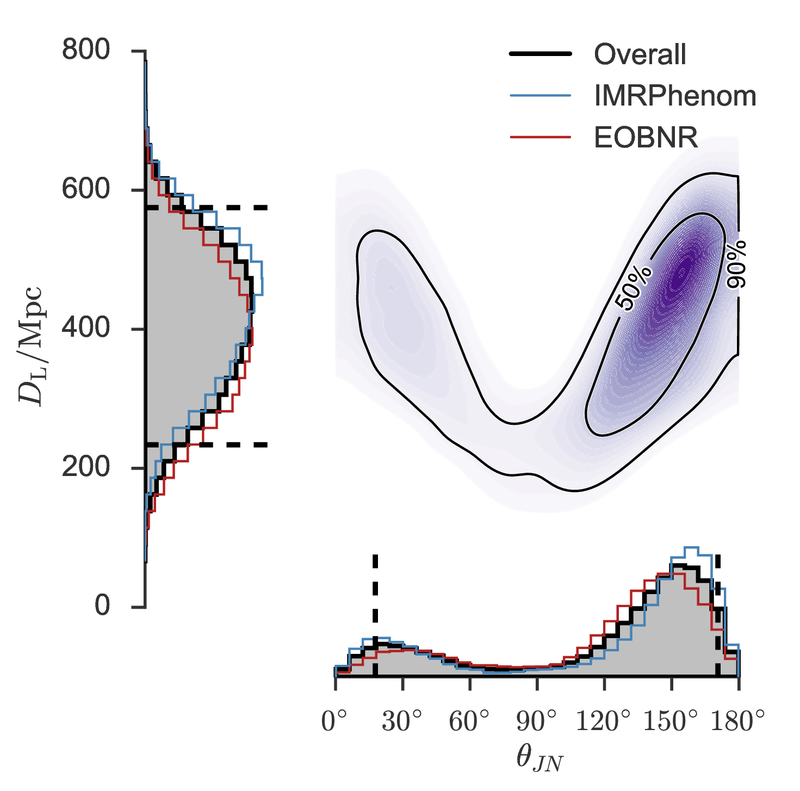 I feel less guilty about writing a late blog post about this paper as I know that it has been a long time in the making. As a collaboration, we are careful in reviewing our results; this can sometimes lead to delays in announcing results, but hopefully means that we get the right answer. 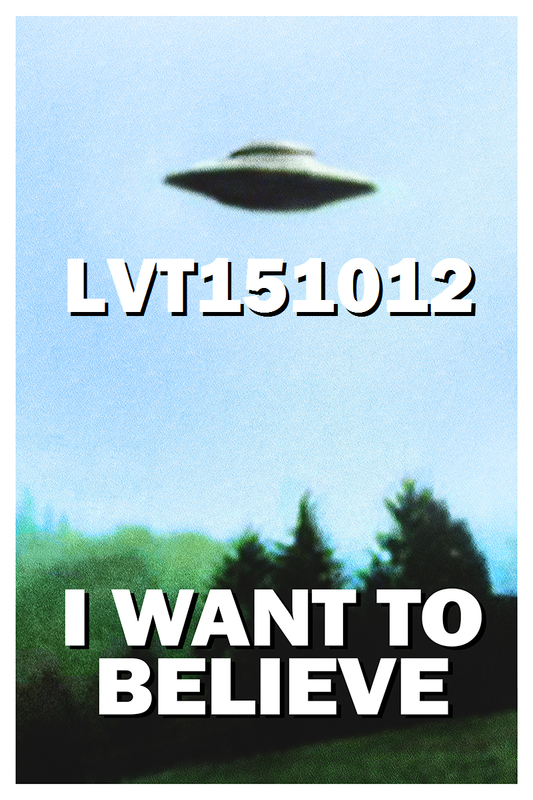 This paper took over three years to review, a process which included over 85 telecons!